Butterfly bush is a magnet for swallowtails, monarchs, and other butterflies. It also has attractive flowers. Yet growing it is controversial. Consider both its benefits and drawbacks before deciding whether to grow it. Plant taxonomy classifies butterfly bush as Buddleia davidii. It's treated by gardeners as a perennial flower, but, botanically speaking, it's considered a shrub. There are many cultivars of butterfly bush, and exact traits vary from cultivar to cultivar. Growing conditions also impact the plant's mature size. The species plant grows to be 6 to 12 feet tall, with a spread of 4 to 15 feet, but the cultivars generally stay smaller than that. Blooms develop in clusters on floppy panicles in purple, pink, white, or red and often have an orange throat in the center. They bloom throughout summer if deadheaded. Leaves are lance-shaped and grayish-green on their undersides. They're fast-growing shrubs with arching branches. Black Knight is one of the most popular cultivars of butterfly bush; its deep purple blooms are so dark as to be almost black flowers. 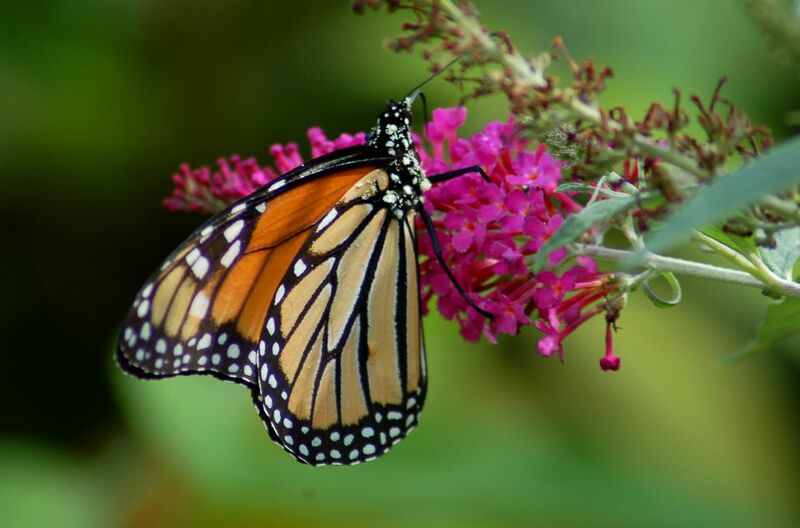 Grow all of the butterfly bushes mentioned here in USDA planting zones 5 to 10. They're native to China, and it's with this fact that the story of the plants' controversial status begins. That's because butterfly bush is considered invasive in many areas of the U.S. Check with your local county extension to learn whether or not it's invasive where you live. If it's not listed as invasive in your area but you're still worried that it might spread, confine the plant within the bounds of your garden by deadheading since this shrub spreads via seed. Alternatively, grow a native shrub as a substitute. Butterfly bush attracts tiger swallowtails and monarchs. But this nectar plant attracts hummingbirds, too. The shrub also attracts the bees that pollinate other plants. It's rabbit-proof and deer-resistant. Apply garden mulch around your plants in the fall, then prune them back to the ground in late winter. New shoots emerge from the roots in spring. Butterfly bushes flower on new wood. Pruning improves blooming, giving you incentive to prune them. What you sacrifice in height you make up for in flowers. This is a plant for full sun and needs well-drained soil. It's relatively drought-tolerant. Even those who don't care about attracting wildlife use butterfly bush plant for aesthetic purposes. As a tall plant, it's a good choice for the back row of a perennial border. To achieve the best visual appeal, mass plantings of butterfly bush together. The natural unruliness of the plant lends itself to use in cottage gardens. The strongest argument to be made against growing butterfly bush is that the species plant is definitely invasive in some regions. It may possibly become invasive even in other regions in the future. Allegedly noninvasive, sterile cultivars such as Blue Chip butterfly bush may not turn out to be the solution to the problem, since other plants touted as "safe" sterile cultivars in the past have turned out to be disappointing in this regard. A weaker argument that has become popular is, "While it's a good source of nectar for butterflies, caterpillars don't feed on its leaves, so it's not a legitimate food plant." This may be true, as far as it goes, but it's an excessively narrow perspective. The crux of the matter is still the invasive nature of the plant. If it were to turn out that the Blue Chip cultivar is truly noninvasive, there would be no reason why you shouldn't grow it, as long as you also grow "legitimate" food plants such as common milkweed (Asclepias syriaca). You can, after all, grow both. You'll also hear this related argument: "Because caterpillars don't eat the leaves, it does nothing for the ecosystem, so it's useless, basically just a guilty pleasure." But life wouldn't be worth living without guilty pleasures such as art, poetry, gourmet food, and, yes, plants that serve no function other than to delight our senses. Ascetic arguments only serve to turn us off. If it were eventually proven that Blue Chip is, indeed, a noninvasive cultivar, would you be happy upon hearing the news? Would you rejoice that another choice had been introduced into the arena? Would you at least be mildly comforted that you could now suggest a noninvasive butterfly bush to those who feel they must grow one? Or would you be annoyed that the debate had just become more complicated? It would be convenient if everyone found the native alternatives just as beautiful as butterfly bush, but let's not kid ourselves. We're faced with an inconvenient truth: Everyone's tastes are different, and some people won't find the native alternatives to be as beautiful as what they would replace. We can ask them to avoid growing butterfly bush and, instead, grow the native plants, anyway. But we shouldn't be arrogant about it and smugly pretend that we're not asking gardeners to settle for what are, in their own minds, poor substitutes. It's important to be honest, rather than glossing over reality. Don't confuse butterfly bush (Buddleia davidii) with butterfly weed (Asclepias tuberosa). Butterfly weed is a type of milkweed and serves as a host for monarch butterfly caterpillars. Adult tiger swallowtails and black swallowtails enjoy its nectar. Both plants are referred to as "the butterfly plant." They are, however, unrelated.